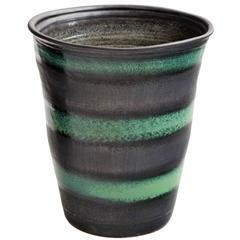 Large scale mid century charcoal and green matte glaze ceramic planter. A porcelain sculpture with green glaze decoration by Tim Orr. Perfect original conditions. Signed under the base, circa 1970.